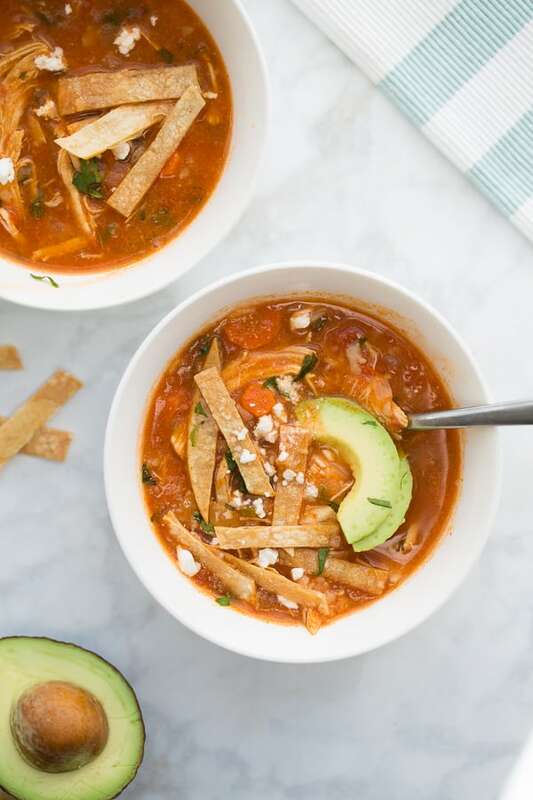 Instant Pot Chicken Tortilla Soup! An easy, weeknight dinner. Flavorful, comforting and healthy! 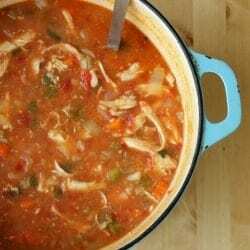 I’ve never met a soul who doesn’t love Chicken Tortilla Soup! It’s flavorful, comforting and healthy to boot. 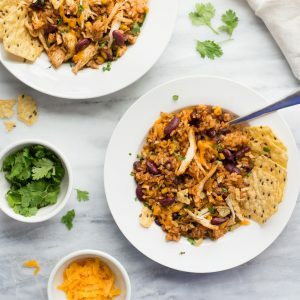 If you’re like me and always on the hunt for easy, delicious and satisfying instant pot recipes, you’ll want to try this one! It’s the perfect thing to make on a busy weeknight. 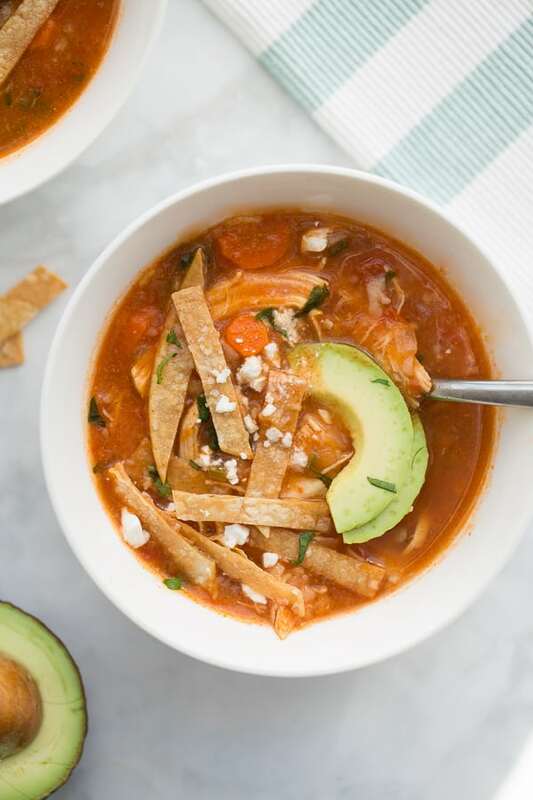 This Instant Pot Chicken Tortilla Soup is adapted from my long-time favorite recipe for Chicken Tortilla Soup. That recipe is one of the oldest on this blog – and still loved today! The trick to this soup is adding some sliced corn tortillas in as it cooks. The corn tortillas thicken the soup slightly and give it a delicious flavor. CLICK TO PIN THIS RECIPE FOR LATER! 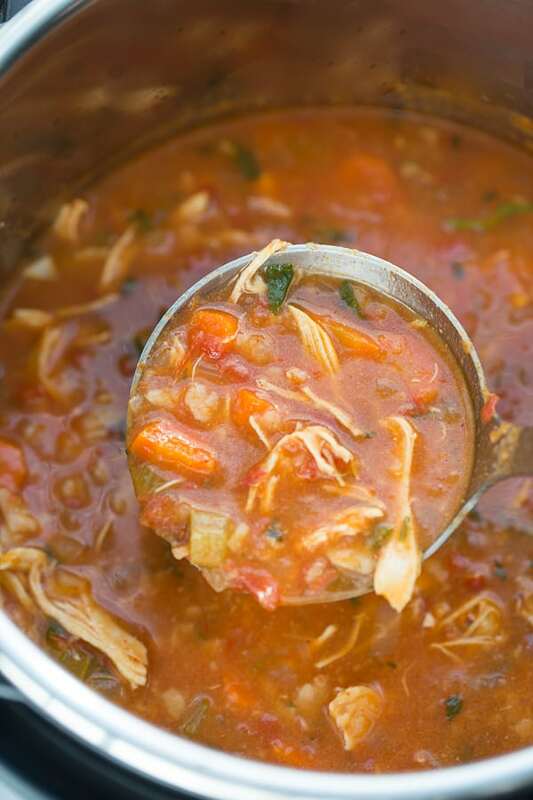 Making this Chicken Tortilla Soup in the Instant Pot speeds up the process making it a great weeknight dinner. I know sometimes waiting for the Instant Pot to come to pressure then natural release makes Instant Pot Cook times misleading – but this one should be done in 30 minutes. I also love the hands off approach of making dinner in the Instant Pot. Just set it and forget it! No worrying about stirring, adjusting heat or burning as it cooks. 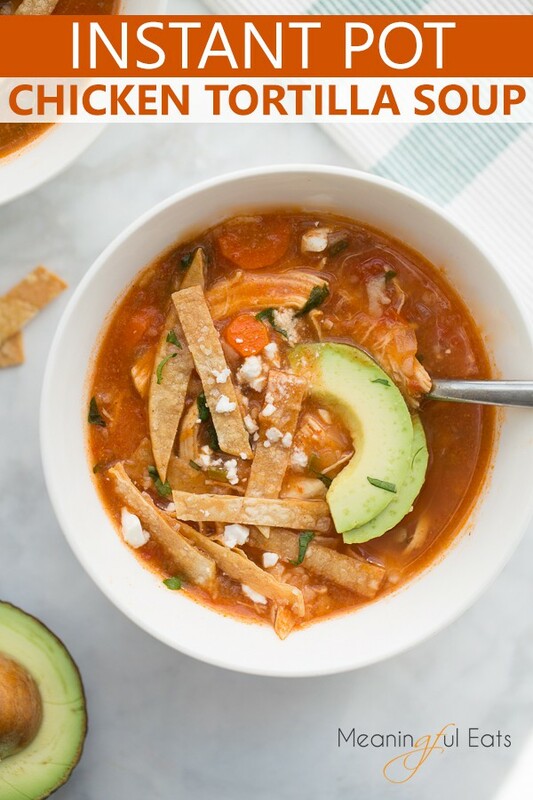 My favorite thing about chicken tortilla soup is all the toppings! I’ve included some instructions in the recipe on how to make crispy tortilla strips. They are really easy to make and way better than corn chips. They make the soup in my opinion! Just slice up some corn tortillas, toss them with avocado or olive oil and a sprinkle of salt then bake until crispy. They are definitely worth the effort. I also like adding an extra squeeze of lime and avocado. If you can eat dairy some queso fresco or cheddar cheese is also delicious! 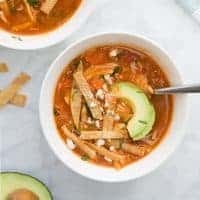 Instant Pot Chicken Tortilla Soup! An easy, healthy, flavorful weeknight dinner! Press the SAUTE button on the instant pot and let preheat for 1-2 minutes. Add the avocado oil, onion, celery, carrots and jalapeno. Cook for 3-4 minutes until the vegetables start to soften. Stir in the garlic, spices and salt. Add the chicken stock, crushed tomatoes, corn tortillas and chicken. Close the instant pot and press MANUAL (or high pressure) and set timer for 7 minutes. When the time is up let the pressure release naturally for 10 minutes before releasing the rest of the steam. Take out the chicken breast and shred with a fork. Add back to the soup. Stir in the cilantro and lime juice. Serve with toppings of choice. Enjoy! To Make Crispy Tortilla Strips: Preheat the oven to 350F. Cut white corn tortillas into strips. Toss with a little avocado oil and sprinkle with salt. Bake for 10 minutes until crispy. Use as a topping for the soup. Yum! Fabulous soup! Next time, I would like to double the recipe. When doing so, do I need to increase the cooking time? Would I be able to add a second chicken breast? Should I add more broth in that case? Would love to make this for dinner tonight but worried that one breast isn’t enough for 4 servings. The soup was yum. I used 28oz tomatoes. The crispy strips are key, dont skimp ’em. I’m so glad you liked it! Love those crispy strips too! Awesome! Making again today for the 2nd time. Perfect spice. This was *killer*. Had to leave out the cilantro, of course, else the whole thing ends up tasting like feet. Great recipe! Can this be made without an instantpot? I only have a crockpot and this looks too good! Can I use a frozen chicken breast? Yes that will work just fine! How much longer do I cook it with frozen chicken breast? The cook time will actually remain the same! Just be sure not to use too much frozen chicken. 1 frozen chicken breast with the recipe as written should work fine! But a big block of a few chicken breasts won’t work. Does that make sense? I knwo this is a really late response but may help someone else… I tried doubling the recipe once but it took so long for that amount of liquid to come to a boil to create steam the chicken ended up overcooking. It was too dry for me. I would suggest making it in two batches if you have the time. I’ve made this a few times now and it’s a favorite. My kids love it too – thanks for the recipe. 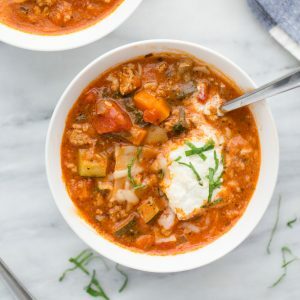 This soup is perfect for a cozy night in! I love how simple it is to make too! I made this when my family came over last weekend. I used the already roasted chicken from the market. It was a hit! thank you!! Made this tonight and the taste was amazing. The only problem is that I got the “burn” error on my Instant Pot twice. The second time, I rinsed the pot clean and scraped the burnt bits but it still happened again. I think the tortilla kept sinking to the bottom. Luckily, the chicken managed to cook in that time. I’d love to make this again but don’t know how to prevent it from burning. My family loves this soup! Received an IP for Christmas and will make for the 4th time tomorrow! Easy, full of veggies and flavor.